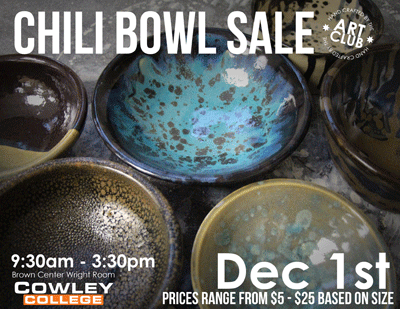 Spending time making decorative bowls, students in Cowley College’s Art Club are ready to display their work during the ninth annual Art Club Chili Bowl sale Tuesday, December 1 in the Earle N. Wright Community Room. The event will run from 9:30 a.m. to 3:30 p.m.
Buy a ceramic bowl made by members of the Art Club and eat the bonus of a bowl of homemade chili. The money raised will go into the Art Club fund and will help with future events or trips.